‘Prelude to the future’, the combination of a petrol power plant and an electric motor define the sheer existence of ActiveHybrid 7. Recent entrant to BMW’s flagship model, ActiveHybrid 7 is a step towards the future. It is meant to be frugal via a culmination of two different technologies on board, one of which is a Twin Turbo 6 cylinder in-line petrol engine and the other a 40 Kilowatt synchronous electric motor. Given this, would it be able to grab the attention that it deserves, let us find out? This particular situation is more like going in for a blueberry cheese cake. If the combination is perfect then the taste and experience can be very enriching and if not then things could really go wrong. For BMW the inclusion of a hybrid in their flagship model is a step in the right direction, it is just that this one is really high on technology. From the outside, this one would resemble the petrol and diesel variants; however a few badges here and there are the only way to differentiate it from others. 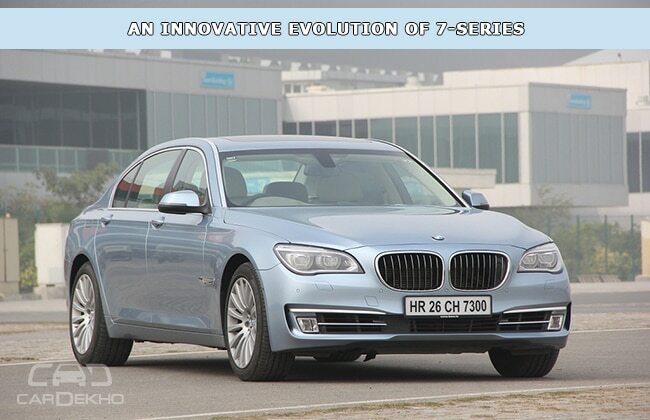 Nevertheless, the evolution of 7 Series brings forward a long contoured bonnet with full LED headlamps as standard fitment across all variants. BMW’s trademark kidney grille has bigger chrome surrounds with an arrangement of nine slats instead of twelve as available before. Then there is the lower half that features substantial amount of chrome, be it the left or right beyond the pair of fog lamps. The inclusion of two narrow vertical air intakes are a part of ‘air curtain’ technology simply help in the aerodynamics that results in better fuel efficiency at higher speeds. Availability of mounted cameras on the front grille and on both sides of the front bumper helps improve the dynamic of this L (larger) premium saloon. On to the sides, apart from new 19 inch rims and a few Active Hybrid 7 letterings on the C pillar there is nothing more to it. In profile, due to the larger wheelbase its ground clearance does seem to be an issue keeping our Indian roads in mind. However availability of auto height adjusts does brighten up the prospects by making it easier to go over those big bumps on the road. The rear in typical BMW style bears L shaped tails lamps with a chrome strip running right across and badge to relate it being a hybrid. Chrome finished tailpipes and reflector further highlight the rear appeal. Its paint job further complements the overall design. Going by its class and the segment that it falls into, one would expect to get the best. No doubt that the ActiveHybrid 7 L is supreme on quality, built and finish but what does not go down too well is its repetitive interior design. This is one thing that is common between all siblings (7, 5, 3 and 1 Series) that bring us to the all important point that why does it to have an Rs 1.5crore price tag? Well this one is all about technology and innovation, thus the features list is enormous and worth mentioning. To start off, there is BMW’s Connected Drive in the form of i-drive which is the basis of controlling specific systems on board such as entertainment, information and communication. Speaking of entertainment, ActiveHybrid 7 caters to a 1200-watt Bang & Olufsen surround sound system with 16 speakers mated to a 6 CD changer that disperse supreme sound quality for occupants. Availability of integrated navigation system along with GPS (Global Positioning System) with hard drive storage puts this sedan right up with most of its competition. Optional feature but on board ActiveHybrid 7, the heads up display placed directly in the driver’s vision comes in really handy to avoid any distraction which would be the case while operating different systems such as entertainment and information. Its Park Distance Control works on the principal of ultra sound measurements for both front and the rear. Clubbed with this feature are 5 different cameras that provide a bird’s eye view of the vehicles surrounding especially at the time of parking. Cool and a very useful feature, it also comes fitted with Night Vision that warns the driver of people, animals and for that matter anything that is crossing the vehicles path even outside the illuminated area of its headlight. With majority of the features already discussed, let us now turn our attention towards comfort. Both front and rear feature electrically adjustable seats, thus there is ample of head, shoulder and leg room to seat five individuals within. As a part of the package, there are two 9.2 inch flat screens at the rear that serve as mode of entertainment and communication while being on the move. From a safety point of view, BMW Active Hybrid 7 offers eight airbags, Dynamic Stability Control and run flat tyres. Futuristic yet practical, this is where it all comes together. This is not the first time that we hear of it, for that matter there are some pretty famous names, but currently we are talking about India and in this reference Active Hybrid 7. Therefore, this Hybrid is a culmination of a Twin Turbo six-cylinder petrol engine and a 40 Kilowatt electric motor that work in tandem with an 8-Speed Steptronic automatic transmission to power its rear wheels. In numbers, the 2979cc petrol engine alone produces a maximum power output of 320bhp with 450 Nm of torque. While electric motor on board produces 55bhp of power. With specifications out of the way, time that we spoke about the manner in which it functions. Being a Hybrid, the first thing that one would notice is that with turn of the key in the ignition it’s the electric motor that comes to life. Very silent, one can almost go unnoticed if it were for the noise (the initial stint that is) after which at some point when you start accelerating its petrol unit kicks in effortlessly. If were to only talk about the electric mode then, this vehicle can go up to speeds of 60kmph with a distance range of about 4km. To be able to function efficiently, its supply of energy comes from lithium-ion battery which is charged through a regeneration system as soon as the driver lifts off or applies the brake. In its case, the electric mode can only be accessed through the Eco Pro Mode. Remaining options such as Comfort is more suited for leisure driving while Sports gives a slight spirited performance from the engine as well as the automatic gearbox. Sports Pus is more outrageous with a sweet throttle note which would music to the ears for enthusiasts like you and me. Though one must say that the level of excitement behind the wheel is not as much as it should have been considering that there is Twin-Turbo Six Cylinder petrol engine under the hood, but nonetheless one cannot complain. Sitting pretty on 19 inch alloy wheels bearing Pirelli rubber with 245 section tyres in the front and 275 sections at the rear ActiveHybrid 7 grips the surface of the road nicely. Though there is a bit of body roll which darkens its handling characteristics by a bit otherwise ride quality is fairly good both up front as well as the rear. The only issue which was a bit of a concern is it low ground clearance which can be helped to a certain extent by activating Auto Height Adjust in order to go over those humongous speed breakers which are a common sight on Indian roads. A definitive ‘Prelude to the Future’, BMW ActiveHybrid 7 is a well packaged piece of machinery that aims to be a bit kind on the environment and at the same time more fuel efficient (13.85kmpl) than its normal petrol sibling (11.62kmpl). Its plethora of gadgetry on board with technology such as the electric motor mated to Twin Turbo six cylinder petrol engine is enough to strike the right balance needs to consume one’s sweet appetite which in this case happens to be the Blueberry Cheese Cake. It’s just right, neither to over the top nor down under.